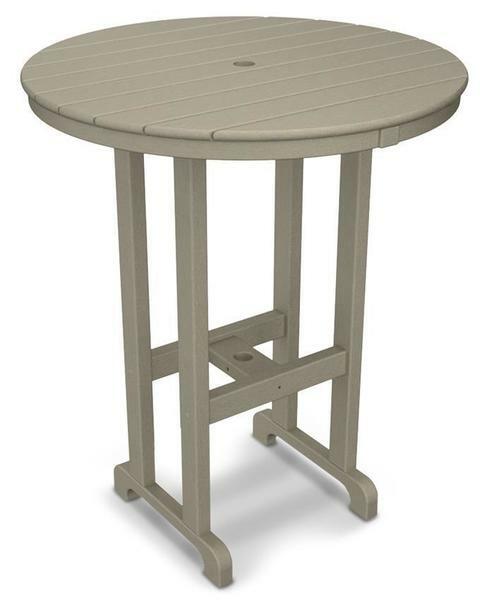 Add a stylish dining area to any outdoor space with our durable POLYWOOD 36" Round Bar Table and make sure you have a place to gather for every get-together. Crafted from eco-friendly Polywood, this bar table will offer decades of outstanding service, while requiring very little maintenance to maintain its beautiful appearance. The poly material used in this table is derived from post-consumer recycled plastics, combined with the vibrant color you choose, and extruded into boards, similar to lumber used in wood furniture. The color is uniform throughout, so you can be sure that your Polywood pieces will stay colorful throughout the years, and will not fade out from sun, salty air, or a long winter freeze. And, since it's made up of recycled plastics, the Polywood furniture will not splinter, chip, rot, or develop mold, mildew, and termites like traditional outdoor pieces. Backed by a 20 year residential warranty, an investment in POLYWOOD outdoor furniture is sure to last you decades. Choose from seven different colors to match any decor. This bar table pairs beautifully with our La Casa Cafe Bar Arm Chairs and Side Chairs to create a set that will look great in any outdoor space. Box One Dimensions - 44" x 37" x 3"
Box One Weight - 53 lbs. Box Two Dimensions - 39" x 6" x 4"
Box Two Weight - 16 lbs.